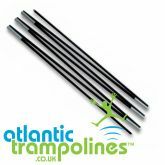 Trampoline tent poles from Atlantic Trampolines. Replacement trampoline tent Pole packs. These replacement parts are ideal if you have lost or broken tent poles. These replacement poles are suitable for the specified trampoline tent and includes 3 complete poles. Unsure if these will be suitable? Please call us on 0800 032 5879 should you have any questions before purchasing.